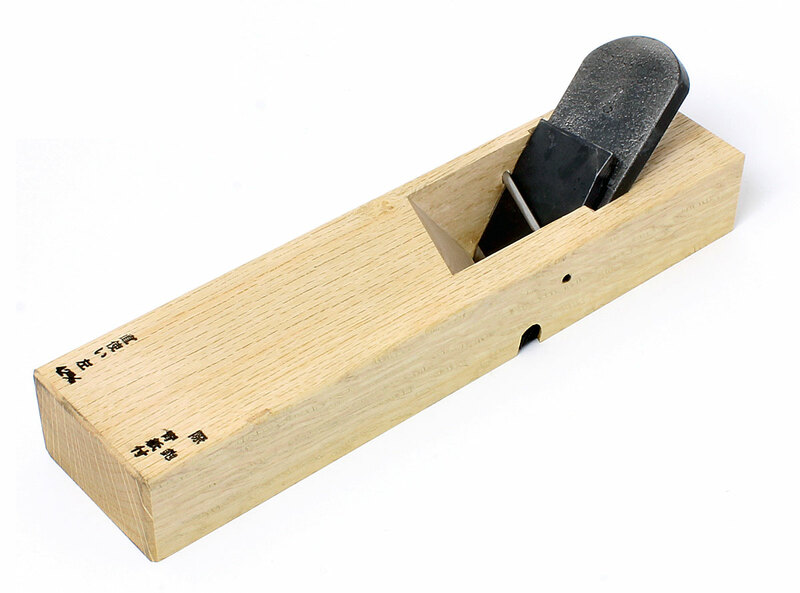 You can ease the edges of your work effortlessly with this Japanese chamfer plane, Mentori Kanna. 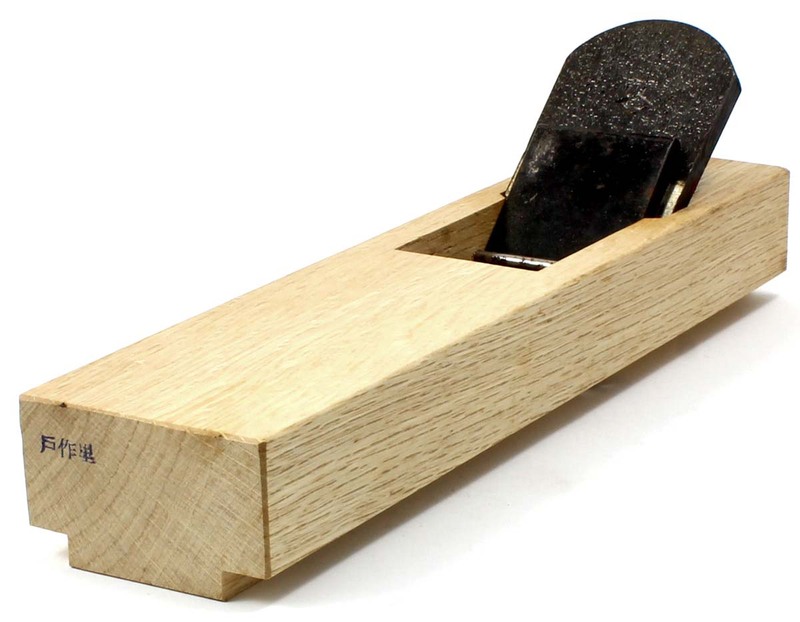 Because the plane's iron is set at an angle to the body, it makes a "pulling" cut. You get much better results because the iron is brought into contact with the work progressively (holding a plane at an angle to the workpiece is also effective in other planing work - try it; you'll be convinced!). The iron of the Mentori Kanna is adjustable side-to-side; if one part of the iron becomes dull, you can adjust it to present a sharp part of the edge, and temporarily put off sharpening. Chamfer angle 45°. Enlargement! 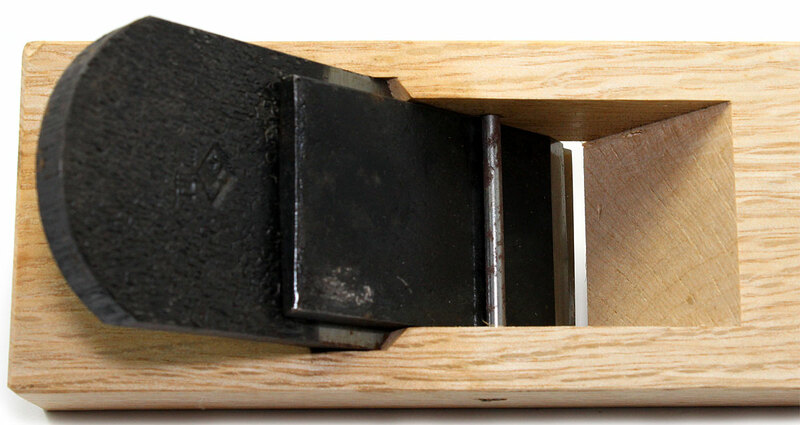 The angled iron in this rabbet plane allows a pleasant, pulling cut - no jerks or seizing while cutting the wood! The plane comes in right- and left-cutting models. 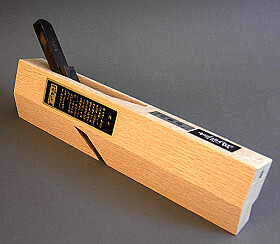 This feature is not only designed to allow comfortable planing for both right and left-handed people: if the planes are used as a pair, one has the possibility to cut always with the run of the wood fibers and to reduce or eliminate the problems with tear-out associated with cutting against the grain. The plane body is made of white oak. This plane comes in two widths. The iron is of laminated steel about 7 mm thick. The cutting edge is formed of "Blue Steel", a modified carbon steel. A chip breaker allows a good, uniform depth of cut and reduces tear-out. Same as above, but cuts on right side. This plane clears away waste material on the side of rabbets. It can be used to widen, adapt, or straighten the cut. For more comfortable working there is a left cutting and a right cutting model. The iron is 20 mm broad, but because of the angle ground into the end of the blade, the width of the cut ends up being 32 mm. The rabbet can be cut to a maximum depth of 26 mm. The plane is 260 mm long. The body is of white oak. If you want to work on the sides of the slots of this plane: the minimum width of the grove should be 20 mm. If you want to work on narrower slots, the plane must be modified and the lower piece of the body cut somewhat narrower. The iron is made of laminated carbon steel. A chipbreaker allows a very thin ribbon of wood to be cut. Unlike most Japanese planes, this one is ready for use. We recommend nevertheless to flatten the mirror side and hone the blade on a fine stone before use. The same as above, but right-cutting. 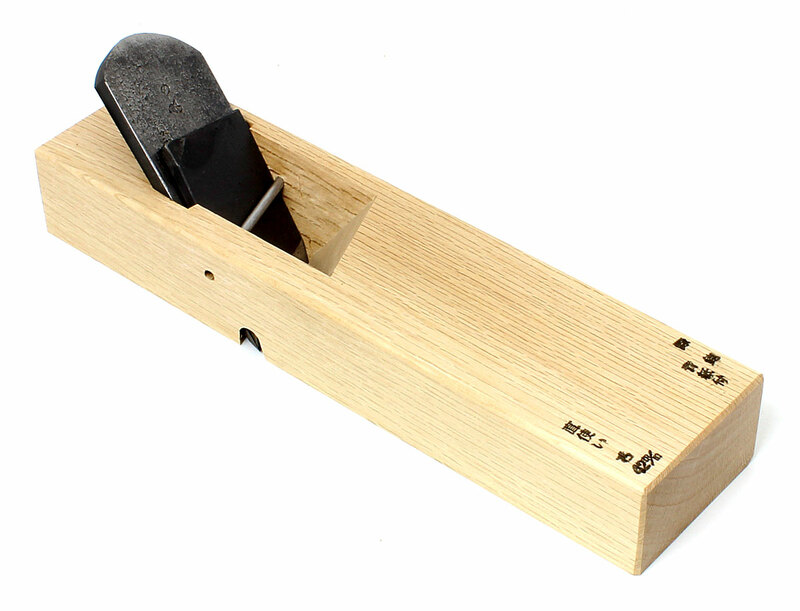 These Japanese rabbet planes have an offset sole and an iron of laminated carbon steel 8 mm thick. 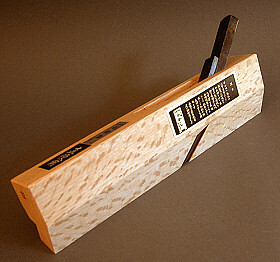 A chip breaker helps - during fine work - to avoid tear out in the wood. There is a generously-sized throat at the top of the plane to allow shavings to work their way out of the body and prevent clogs building up at the sole. This works, naturally, only if the plane is correctly adjusted. For this to work, the chip breaker must be fixed as near as possible to the iron's cutting edge (less than 1 mm), so that only a thin shaving is removed. The iron should be flattened, sharpened and honed before use. The plane iron bed may need to be widened slightly before use also. The body is of white oak. Both planes are 258 mm long. 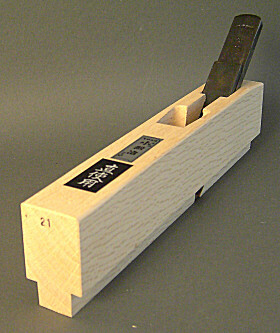 This plane is used to surface a number of different posts or frames at the same time during the crafting of Japanese shoji screens and doors. The side rails, with a slanted slot, are used to set the final dimension of the workpieces and are fixed in place using the screw shown. 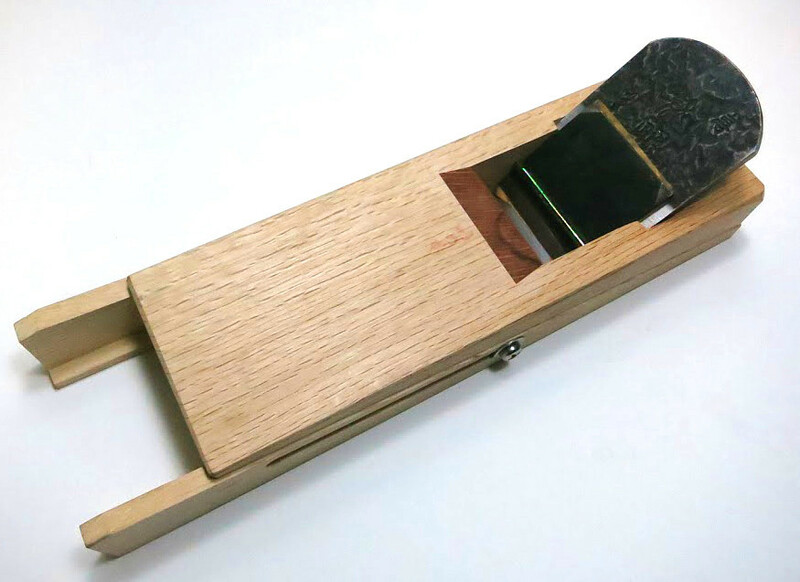 There is a bamboo roller in the sole of the plane to prevent individual frame pieces from bending up, while guaranteeing an even pressure on all the parts. The plane body is 272 mm long and 88 mm wide. The side rails are 320 mm long. The laminated iron is 68 mm wide and made of high-carbon steel 10 mm thick at the top and is fitted with a chipbreaker. The plane can handle material up to 60 mm wide. The iron is hand forged by the knifesmith Hideji Ogata. 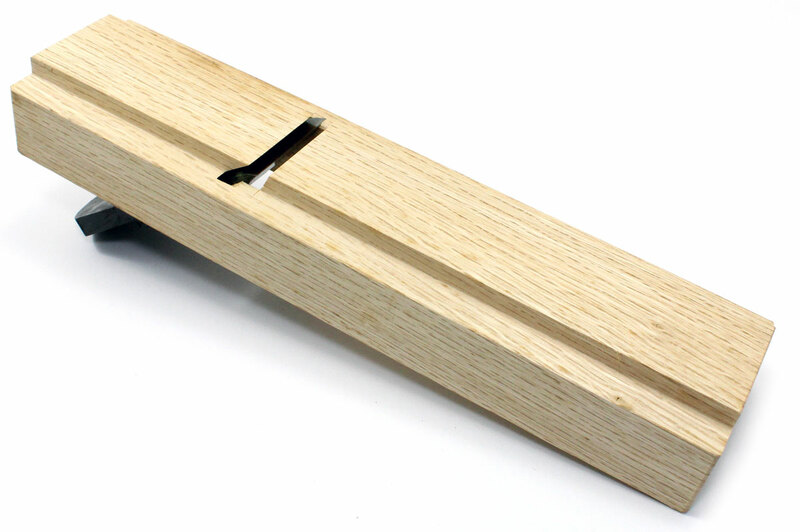 The plane body, in white oak is hand made by the well-known plane (dai) maker Isao Inomoto.